Excitement was high as Sunbeams and Key Stage One and Two pupils recently received a visit from the Northern Ireland Fire and Rescue Service. 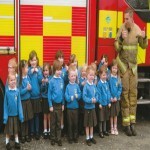 Seeing the fire fighters and fire engine was fantastic, but best of all each pupil got the chance to squirt the big hose! Back in the classroom everyone is hard at work preparing for end of year tests and our Annual Praise Service on 15th June when pupils will sing and play musical instruments.